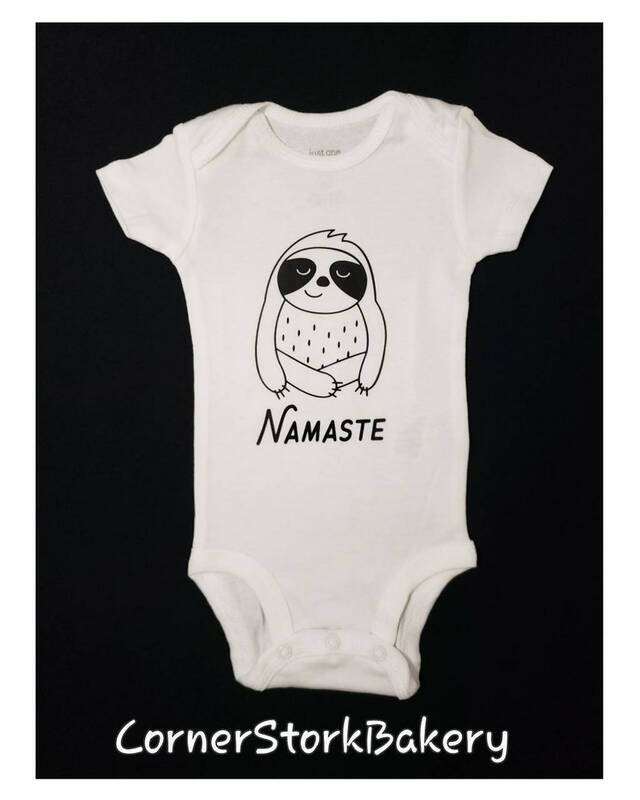 Custom made Sloth "Namaste" Baby Onesie makes a sweet baby gift. It can be given to reveal a pregnancy, reveal baby's gender, a cute baby shower gift, for a holiday, or just because. Sloths are so cute. It's sure to put a smile on the expecting parents faces! This listing is for 1 Sloth custom onesie. • 1 Carter's brand white short sleeve onesie with Sloth "Namaste" design made with black htv. Primary color choice is for the heat transfer vinyl. Add this Sloth Onesie to the Sloth Diaper Cake for a complete and awesome baby gift! Link below.